The purpose of the present study was to examine the growth hormone (GH) response to treadmill sprinting in male (M) and female (F) sprint- and endurance-trained atheletes. A group of 11 sprint-trained (ST; 6M, 5F) and 12 endurance-trained (ET; 6M, 6F) athletes performed a maximal 30-s sprint on a nonmotorized treadmill. Peak power and mean power expressed in watts or in watts per kilogram body mass were higher in ST than in ET (P < 0.01) and in the men compared to the women (P < 0.01). Serum GH was greater in ST than in ET athletes, but was not statistically significantly different between the men and the women [mean peak GH: ST 72.4 (SEM 12.5) compared to ET 26.3 (SEM 4.9) mU · I−1, P < 0.01; men 59.8 (SEM 13.3) compared to the women 35.8 (SEM 7.4) mU · l−1, n.s.]. 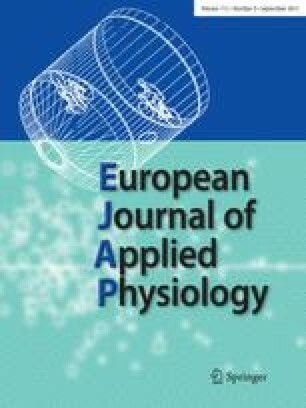 Plasma ammonia and blood lactate concentrations were higher and blood pH lower during 1 h of recovery after the sprint in ST compared to ET (all P < 0.01). Multiple log linear regression showed that 82% of the variation in the serum peak GH response was explained by the peak power output and peak blood lactate response to the sprint. As serum GH was still approximately ten times the basal value in ST athletes after 1 h of recovery, it is suggested that the exercise-induced increase in GH could have important physiological effects in this group of athletes, including increased protein synthesis and sparing of protein degradation leading to maintained or increased muscle mass.